South Park: The Fractured But Whole comes out on December 6, Ubisoft said today, unveiling a bunch of new info about their next cartoon game. 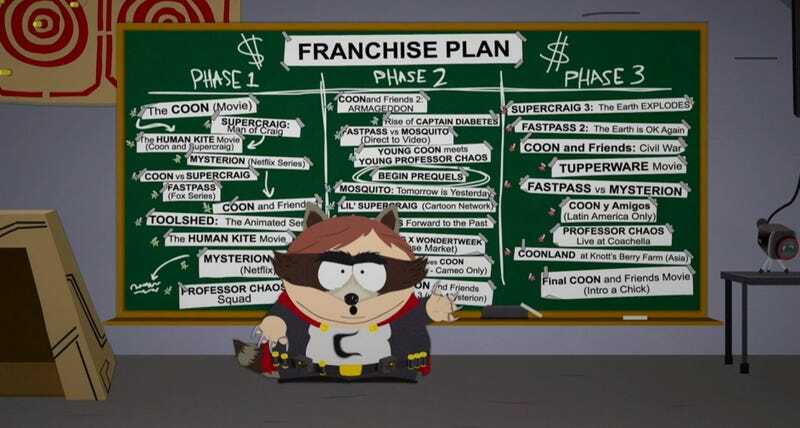 The premise: the South Park kids are playing superhero, and have just entered a civil war... over how to plot out their superhero franchise plans. The Fractured But Whole starts off where Stick of Truth ended—them throwing the stick away—and moves the kids from playing fantasy to dressing up as superheroes. Buying The Fractured But Whole will also get you a free copy of South Park: The Stick of Truth on PS4/Xbox One/PC. In fact, Ubisoft says that you can get a copy of Stick of Truth if you pre-purchase the game starting today. Your main character, Douche Bag from the last game, will get to build a superhero persona by picking from one of several classes like Brutalist and Speedster. He’ll also have a backstory that’s laid out by Cartman in an opening sequence. In a series of videos during Ubisoft’s press conference today, South Park creators Matt Stone and Trey Parker showed off different aspects of the game, including a new tactical combat system (with a grid!) and various interactive objects.